The word 'souvenir' can make many of us cringe, thinking of kitschy items made of plastic that can be found at just about any travel destination. Just like every other tourist destination, we have a long list of shops and trinkets to choose from. Some items for purchase here, unbeknownst to you, may have been illegally poached and are in violation of local laws and regulation. How can you find a meaningful memento that does some good in the process? "We have nothing from China!" is proudly declared at each of their several locations here in Roatan. We love that this local business has found a stylish and affordable way to take someone's trash and turn it into another person's treasure! They create handicrafts and artwork from recycled metal, wood, plastic and glass. From wall art to magnets to jewelry and much more, they have a great selection to choose from. Much of their artwork is inspired from our local marine life. It's a great way to take a memory of that beautiful green turtle you spotted in the ocean back home with you! With locations in West End, West Bay, Sandy Bay and both cruise ship ports, this is an easy place to visit, even if you're only here for the day. In addition to the amazing work they do keeping our reef healthy and beautiful, the Roatan Marine Park Eco Store offers a selection of merchandise and eco-friendly local products. The revenues from these sales go back to support the Marine Park and their local conservation efforts. They offer colorful t-shirts, tank tops, and even long sleeve hoodies that are just right for a breezy night here on the island. 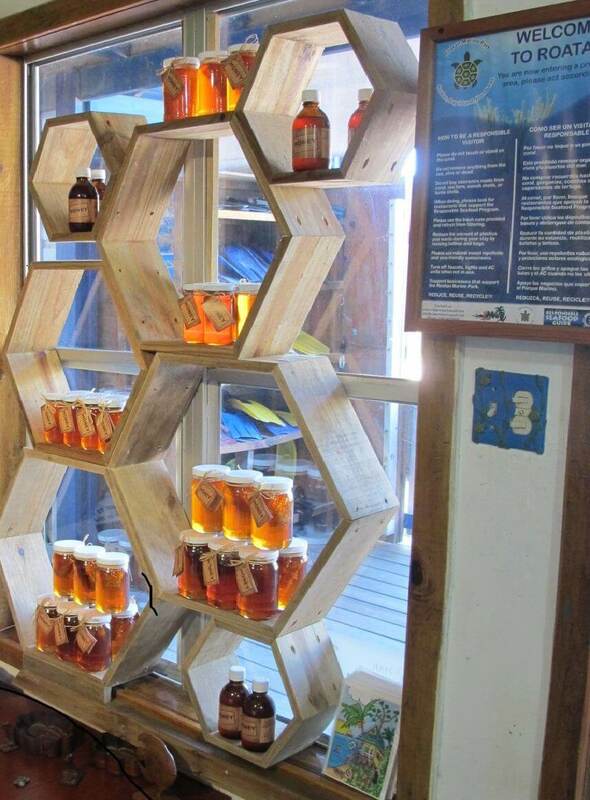 Also for sale is locally made honey, coffee, jams, jellies, eco-friendly mosquito repellents, and even hot sauce! A truly fun souvenir to take home with you is a locally handmade piece of art or jewelry. You can typically find local vendors either walking the streets or beaches offering up necklaces, earrings and bracelets for both men and women. Beautiful stones and intricate braiding make these jewelry pieces truly one of a kind. If you enjoy artwork, you can find prints, paintings, and canvases full of bright and beautiful colors to remind you of the Caribbean. After just about every dive and snorkel trip, this is the book you see in people's hands as we look back at the colorful and lively marine life we see here in Roatan. This is a must-have for any fish enthusiast who enjoys marine identification photographs by local photographer, Mickey Charteris. The current edition includes over 1,000 species in full color and descriptions for each species. All the photos were shot here in the Bay Islands. Without knowing what creatures live underwater, it's hard to truly protect and care about the reef and its inhabitants. This makes a great coffee table book or keepsake to remember Roatan by! No worries! Most of our favorite gift ideas are available for purchase online. Visit their website or contact them directly to find out how you can have a piece of Roatan sent to you and your friends.